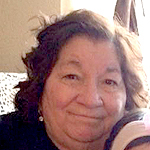 Mass of Christian Burial for Georgia Gunville, 72, of Whitehorse, was held on Monday, Nov. 14, 2016, at All Saints Catholic Church in Eagle Butte. Interment was in the Gunville Family Ranch Cemetery under the direction of Kesling Funeral Home of Mobridge. Georgia passed away Monday, Nov. 7, 2016, at Rapid City Regional Hospital.